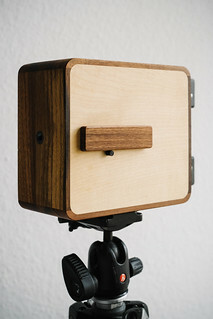 ONDU is a line of wooden chestnut and maple pinhole cameras designed in Slovenia by Elvis Halilović. The camera was funded via a Kickstart project. The project was launched in May 13, 2013. The goal was raised in less than 48 hours. At the end of the funding period (June 12, 2013) $109,391 was raised surpassing the original goal of $10,000. This page was last edited on 7 April 2018, at 02:05.